Like many Mac users, I use Apples Boot Camp to switch between the Mac OS and Windows as required. However, I also usevirtualization tools - Parallels Desktop and VMWare Fusion - which have the added convenience of allowing you to run Mac and Windows programs side-by-side. The only drawback with virtualization technology is that it cant provide the same performance as running Windows software natively, as Boot Camp does. This is especially important when it comes to demanding programs such as 3D games. And, of course, the dual-boot and virtualisation approaches both require you to install a full copy of Windows. 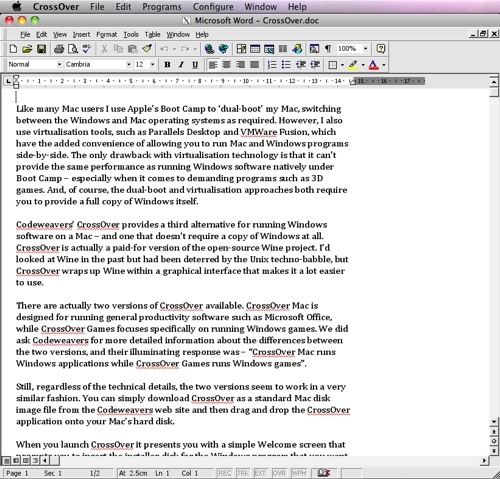 Codeweavers CrossOver now provides a third alternative for running Windows software on a Mac – and one that doesnt require a copy of Windows. CrossOver is actually a paid-for version of the open-source Wine project, which provides technical support and a new graphical interface in return for the £26 licence fee. There are two versions of CrossOver available. 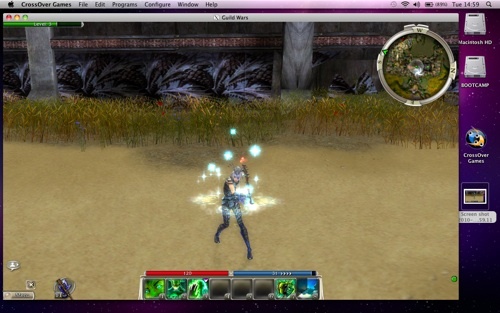 CrossOver Mac is designed for running general productivity apps such as Microsoft Office, while CrossOver Games focuses on running entertainment software. 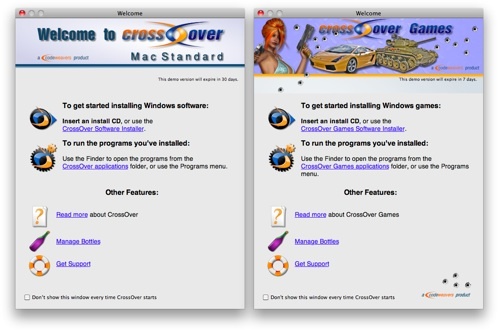 I asked Codeweavers for more detailed information about the differences between the two versions, and its illuminating response was: “CrossOver Mac runs Windows applications while CrossOver Games runs Windows games." Regardless of finer technical details, the two versions work in a very similar fashion. To install the program you simply download the CrossOver disk image file from the Codeweavers web site, open it, and then drag and drop the CrossOver application onto your hard disk. When you launch CrossOver it presents you with a simple Welcome screen that prompts you to insert the installer disk for the Windows program that you want to install. Its also possible to install software that youve downloaded from the Internet as long as youve got the full installer required for that piece of software. 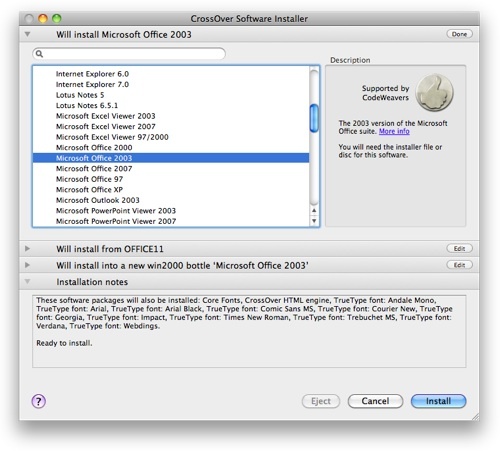 Rather than simply copying the program files onto your Macs hard disk, CrossOver creates a "bottle" – a file that Codeweavers describes as a "virtual Windows environment" – and then installs the program into it. The bottle contains elements – such as a virtual Windows registry – that, in effect, fool the program into thinking that its running on Windows. This approach can be very effective – but only if CrossOver is compatible with the specific Windows programs that you want to use. 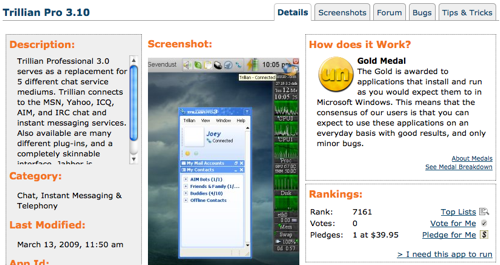 Codeweavers maintains a compatibility database that rates hundreds of Windows apps according to a rather convoluted system of "medals". For instance, my copy of Microsoft Publisher 2003 gets a gold medal rating, which means that it should run well enough for everyday use. However, Word 2003 and Excel 2003 only get a silver medal - more or less OK, but there may be occasional bugs - while the more recent Microsoft Office 2007 just gets a bronze. The database also lists a large number of programs as "untested" or "known not to work". I tested the Office 2003 and Office 2007 suites, and those programs did run well – more smoothly, in fact, than using either Parallels or Fusion. CrossOver even makes Windows programs look a bit more Mac-like by adding a new title bar complete with the Macs candy-coloured control buttons. However, the situation wasn’t quite so rosy when I tried CrossOver Games. I normally test PCs by checking their performance with Far Cry 2, but that falls into the doesnt work category. My current favourite game is Dragon Age: Origins - it gets a silver medal for compatibility, but I repeatedly got an error message when attempting to install it from disk. I found a fellow sufferer on the Codeweaver support forums who had encountered the same error message, but theres no word of a solution yet. Another old favourite is Guild Wars, which also gets a silver rating. This installed easily and was quite playable on a MacBook, although the frame rate under CrossOver was only about half of what we got when running the same game under Boot Camp.